AREA TEAMS INCLUDED: Brackenridge, Burbank, Edison, Highlands, Holy Cross, Jefferson, McCollum, South San, Southwest. Edison forced a three-way tie for third place in District 28-5A with a dramatic 37-35 win over Burbank (4-4, 3-3) Friday at the SAISD Sports Complex. The Golden Bears and the Bulldogs share third place with Harlandale (4-4, 3-3), which lost 37-14 Friday to district-leading Sam Houston. Senior quarterback Jonathan Hernandez (9 of 14) passed for 252 yards and four touchdowns to lead Edison to victory. Hernandez also ran for 133 yards. His 23-yard pass to David Sanchez (90 yards, 3 receptions) stood as the winning score with 8:31 remaining. Trailing by nine, Burbank quarterback Daniel Tello (92 yards, 18 carries) answered with a two-yard rushing touchdown seven seconds before the end. Edison scored three unanswered touchdowns, starting with a two-yard run by sophomore Matt Garcia (76 yards, 17 carries) with 53 seconds until halftime. Hernandez hooked up with Bryan Bolton (105 yards, 3 receptions) for a 75-yard score and Taylor Ahoyt on a 38-yarder to build a 31-21 lead. Burbank led 14-3 on a 43-yard pass from Tello (11 of 21, 157 yards) to senior Tru Bradford (66 yards, 3 catches) with 10:27 left in the second quarter. An 11-yard run by Devin Gusme increased the Bulldogs’ advantage to 21-10 with 2:08 remaining in the quarter. Bolton finished with two receiving touchdowns. Bulldogs back Rubyn Salazar ran for 82 yards and two touchdowns. The Eagles (6-3, 6-1) clinched their eighth-consecutive playoff appearance with the District 28-5A win over Jefferson (2-6, 2-4) Saturday at Alamo Stadium. Brackenridge scored the game’s first 18 points. Hernan Cabral made a 32-yard field goal, Francisco Soto returned an interception 32 yards and Jalen Davis hauled in an eight-yard pass from Antonio Lopez (, 241 yards) in the first quarter. Jefferson scored its first points on a 13-yard pass from Weston Redding to Henry Bocko (40 yards, 3 receptions) with 4:40 left in the first half. The Eagles had a 25-7 halftime lead after Trey Mathis (166 yards, 15 carries) scored the first of his four rushing touchdowns with a 51-yard dash, nearly in consecutive order. The streak was interrupted only by a one-yard run from Lopez and a 62-yard run from Jefferson junior Jesse Flores (136 yards, 23 attempts). Brackenridge senior Lee Terrell had seven receptions for 101 yards and Macco Marble caught five for 64 yards. The Eagles limited Jefferson to 173 total yards. The Dragons (4-4, 2-1) recorded their second-consecutive District 28-6A win, helping to force a four-way tie for first place, by defeating South San (2-6, 0-3) Friday at South San Stadium. Southwest shares first place with Corpus Christi Carroll (7-1, 2-1), Corpus Christi King (6-2, 2-1) and East Central (4-4, 2-1), which downed Corpus Christi Ray (6-2, 1-2) 40-18 Thursday. The Dragons took command with a 12-yard rushing touchdown from senior Jon Cruz (179, 17 carries) and a 34-yard pass from Bowen Crisp (6 of 12, 73 yards) to Brandon Salinas in the first quarter. Southwest’s Sergio Estrada added a 25-yard field goal in the second period. South San notched its first touchdown on a six-yard fumble return from Jeremiah Prouty and trailed 17-6 at halftime. Cruz broke a 62-yard touchdown run early in the third quarter and Tyrone Middleton (106 yards, 15 carries) completed the scoring with a 14-yard run with 4:28 remaining in the third quarter. Southwest limited South San to 63 total yards, while gaining 395. The Dragons ran for 322 yards. The Cowboys (2-6, 2-4) ended a four-game District 28-5A losing streak with a win over Highlands (0-8, 0-6) Friday at Harlandale Memorial Stadium. 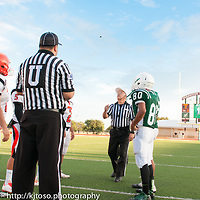 McCollum took an 8-0 halftime lead on a two-yard run from senior quarterback Ralph Vidal and a safety. Junior Mike Ramirez (225 yards, 27 carries) scored second-half touchdowns with runs of seven and 49 yards, following the Owls’ lone touchdown. Highlands scored on a 33-yard pass from senior quarterback John Cervantes (10 of 18, 156 yards) to Thomas Salame (54 yards, 4 receptions), who also has started at quarterback. Quindon Boston finished with 66 receiving yards and 53 rushing yards. McCollum tight end Robert Salas caught four passes for 44 yards. Jeff Valdez returned from an injury to make a 21-yard reception. The Cowboys produced 352 total yards while holding Highlands to 201. McCollum committed four turnovers and Highlands had three. The Knights (6-1, 4-0) registered a commanding win Saturday that prepared them for a TAPPS District 3-II first-place showdown with Austin Regents. Holy Cross put the hammer down against winless Corpus Christi John Paul II (0-9, 0-5) for a homecoming victory at Harlandale Memorial Stadium. It was the third shutout of the season for the Knights defense. Holy Cross limited John Paul II to 57 total yards, including 36 rushing yards on 28 attempts. Meanwhile, the district co-leaders gained 579. Holy Cross senior back Greg Scott (204 yards, 10 carries) scored the game’s first three touchdowns on runs of 17, 19 and five yards. Scott also caught a 71-yard touchdown pass from Steven Gutierrez (8 of 11, 178 yards) about four minutes before halftime. The Knights led 21-0 after a quarter and 41-0 at the half. Nazario Coleman returned to action and threw a 38-yard touchdown pass to Steven Villela. Jaime Ramirez ran for 55 yards on four carries. David Sanchez had 45 receiving yards and a touchdown on three catches. The Knights will play Regents (7-1, 4-0) 7 p.m. this Friday in Austin.